Combining "OUR VOICE" ami "FEDERATION REPORTER"
Beaches, will start at 11 a.m.
the rotunda of the auditorium. of folk, classical and jazz music. come to a central point. General to grant them parole. always stood for and fought for." "We will also travel to Mt. the Mission to the community. opinion I have my opinion." and part of the "inherent right"
their personal efforts in the 1980 Combined Jewish Appeal-Israel Emergency Fund campaign. award breakfast were (pictured above standing, left to right) Sol Ganeles. Sybil Senecoff. Robert Cahn. Louis Perlman. Henry Boodman. Abe Bisgaier. Ada Columbus. Louis Bailey. A Brown, Seymour Greenspan (Standing, left to right) Samuel DurbinSathan.Cohen. and rich in authentic detail. a lesson in social history. 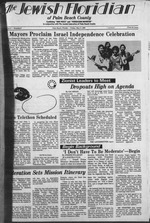 fill vacancies of two-year terms ending June 1982. Respectfully submitted by the Nominating Committee. Tuesday, May 27, at 1 p.m.
Temple in West Palm Beach. nesday, May 7 at 7:30 p.m.
on Wednesday, May 14, at noon. May 4 Is the Jewish Community going conservative? Minimum Deposit $10,000 Simple Interest. "ut^ .vtv- ,av V n S Maun. ^. >'.A/V w SIWV *-iasaiinr it rhr ".mit JUm ';. vnt-uuitM ant jis*.-"TTninacuo a nn4c*TnTt, "*! nrBiva n a aunp* a.
UK ^T^ *? ""^ 3"1""
* *nt s tr rtrtir lifcv )yiu. hr "Nw^i. iMaa rtw .aw*. mtilr h* Hkm 1 w.vwi^yi,. - Ha him. mim NNMaj MOt. an wb m am* "
mental grasp of life's realities." health and alertness of mind. with his spouse or children. Horowitz of North Pahn Beach. Tha oldest Jewish-owned chap** in Browed County. Paul P. Zimmerman, department first junior vice commander. (Center, standing left to right) Martin Ulanoff. Albert B.
to right) Nathan Weinstock. William Lissauer, David Kaplan. The Ladies Auxiliary of the Jewish War Veterans. Post 501.
book that reveals the "hole"
the bagel an international food. the Benjamin S. Hornstein Elementary School to Benjamin S.
the home of Mr. and Mrs. Lawrence Milgroom of Palm Beach. munity Day School reception given in honor of Benjamin S.
toyed with Reis ideas On March 22. 1876.
is to open the house' when mishpocha. best And because of its great taste. The Jewish Community Center of Palm Beach County Inc.
6, at the Plantation Holiday Inn. president or Mrs. Harry Kaye. highlight a tribute to presidents. -A COMPLETE UNE OF PRINTING"
Tuesday, May 27 at 1 p.m.
latest fashions from Lise's Ltd.
Club June 27,28, and 29. Harriet Stiller or Rose Schreer. Belvedere in West Palm Beach. on Wednesday, May 7, at 7 p.m.
held at Ramada Inn, May 29.
held at Anshei Sholom at 1 p.m.
Plantation on May 4, 5, and 6. * Palm Beach, Fla. 33411. Wallace on the "60 Minutes"
' "I Hungary, Czechoslovakia and Poland. Departures: June 29, July 13. July 27, Aug. 10, Aug. 24.
carry on without the girls. M-F 7:30 to 11 a.m.
'My Family is Yours To Enjoy"
For information and brochures call any travel agent. jvboard 10a.m. American Jewish Committee board 10 a.m.
ftgroup 10 a.m. Jewish Community Day School board 8 p.m.
jft# Congregation Anshei Sholom board 9:45 a.m.
ft;Congregation Anshei Sholom Men's Club executive 10 a.m.
$ B'rith #2939 board 10 a.m. Temple Beth El board -8 p.m.
$ #408 1 p.m. Temple Beth Sholom Sisterhood 12^30 p.m.
ft Hadassah Lake Worth South Palm Beach board 10 a.m.
g ALLOCATION MEETING 7:30 p.m.
:ft board 9 30 a.m. Hadassah Golda Meir board 12:30 p.m.
ft Sholom Men'sClub -9:30 a.m.
ft: UTIVE MEETING 7:30 p. m.
:ft 12:30 p.m. B'nai B'ritrfWomen Menoroh 10 a.m.
:ft Council of Jewish Women Palm Beach board 10 a.m. Round trip via Air Florida at Freeport Inn Taxes additional. 3 nights Las Vegas. Air/Hotel/Transfers/Tax. will be in need for the holidays. need was greater then ever. scheduled for May 11 through 18. Ken Bolinsky at the JCC. ANNOUNCING 'KEHILLA: TO REACH OUT"
Kdbye at 1:30 p.m. 3 p.m.
Briy in the late afternoon. e call C.S.S.C. for time. sdays from 10 a.m. to noon. Monday from 1 p.m. to 3 p.m. Monthly meeting May 13 -1 p.m.
Card Party May 18 at 1 p.m.
to 4 p.m. Lunch will be served. Century Village at 10 a.m.
delay limited seats are available. April 27 30. A special "hats off"
5th Annual Meeting of the J.C.C. KIMBERLY COSMETICS AND SKIN PRODUCTS. Offica Mr. Mon Tu. Wd Fri Thurs. ft Sat. ftrts t Crafts, Husic, Draia C Sports. Poad, is a sprawling 18 acre site. prograa is a workshop oriented prograa. Painting, Crafts, etc., will be developed. prograa for aature boys C girls. Faaily aeabership required for all prograas. and Special Guest Speakers from Israel and the US. Open for breakfast 7 10:30 a.m.
i proposed by the U.S.
that of a political entity. 7129 Lake Worth Road Lake Worth. Flo. director of the Midrasha Judaic more mature level of high school. preceding Bar or Bat Mitzvah. develop into their teen age years. .
the second semester of operation. than concerned them the most. Women's American ORT Director of Community Relations through chapter presidents. for its annual planning con- topic will be "1980: Year of all board members to attend. ference on May 19, at the Helen Crisis." hotts Barbara Shulmon and Steve Gordon. and 5 p.m. Dally Services: 8:15 a.m. and 6:30 p!m. man Cantor Arthur B. Roeenwasser Services: Daily 8:30 am. Cantor Sabbath Services, Friday at 8:30 p^n. JT Sa?uX .S atW *"*"" ^^ fM" at *"
Must Be In Fine Condition)! 1897 PALM BEACK LAKES BLVD. "It is also important to note,"
reaches greater and greater goals. port I would eke Hu a comphmenOefy copy of your "FAMILY KGtSTtY". *** AlW ** *nAt to tarns! be part of the West Bank. nMam an an undivided city u.